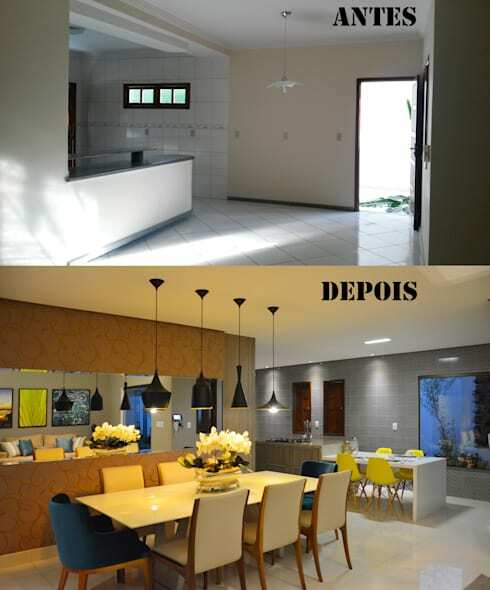 In the Brazilian municipality of Itapetinga, we came across a residence which was once lying in a bare and boring state. Empty spaces, bland walls and lifeless floors were urgently crying out for some designer love. 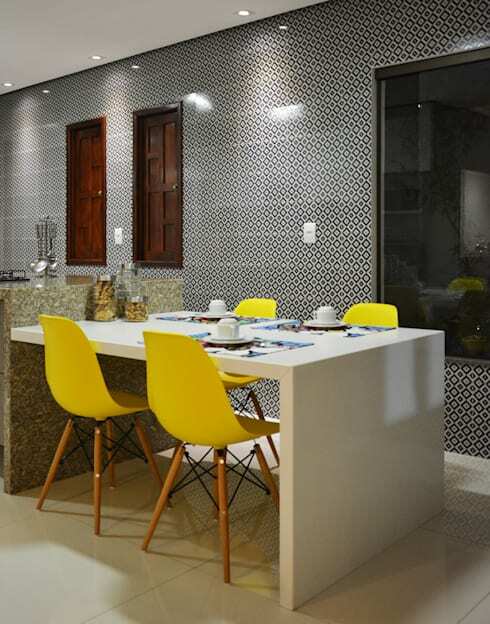 So the talented architects from Cardoso Chouza Arquitetos stepped in to fill the home with trendy furnishing, cheerful and bold hues, artsy touches, and smart designs. So from bright chairs to pretty chandeliers and inspiring paintings to ornately patterned wallpapers… this home has it all. Take a closer look now to know more about the transformation. Barren walls and mundane white tiles on the floor hardly promised any unique aesthetic pleasure in the living space before. The large and dark wooden doors added to the gloomy ambiance too. But now, they have been replaced with clear glass doors which allow sunlight to flood the space generously, while vibrant artworks glam up the walls brilliantly. A cosy couch peppered with blue, brown and beige cushions invite you to sink into its comfy depths, while quirky geometrical patterns dominate the fashionable chairs. A modish coffee table, some indoor greens, a few knickknacks and soothing lighting complete the look here. The kitchen and dining spaces were as empty as the living area. Lack of colours and cosy furnishing made the areas gloomy and unwelcoming. But look at the stunning makeover now! A sleek cream dining table surrounded by elegant blue and cream chairs offers cosy and stylish seating here. The brown wall subtly demarcating the kitchen from the dining, come with delicate patterns all over and feature a long mirror to jazz up the space. The mirror lends the illusion of extra space too, while industrial chic black pendant lamps make for chic lighting here. A gorgeous arrangement of fresh blooms makes dining a pleasurable experience. The kitchen is an open and contemporary affair with an exciting breakfast nook, which we will now take a closer look at. Peppy yellow chairs with trendy wooden legs flank the smooth white breakfast nook, which is an extension of the kitchen island. What a happy way to begin each day, while sharing a hot and yummy breakfast with the family! We also love the black and white quirkily patterned and gleaming wallpaper, which adds a highly individualistic edge to the kitchen. 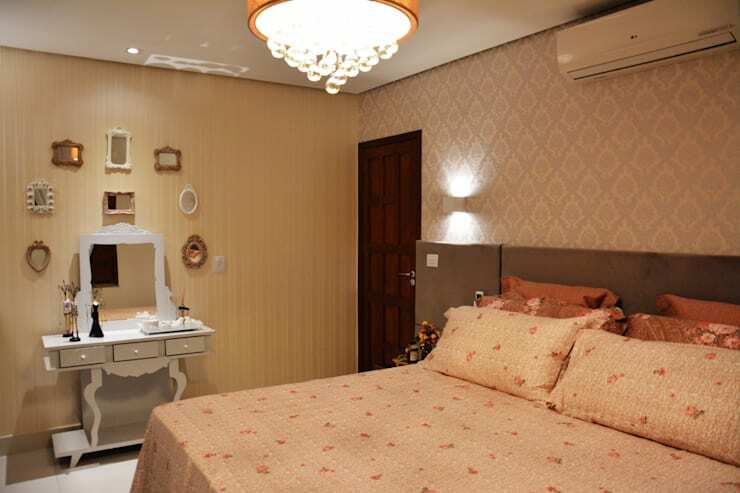 Soft peach-hued bedding and comfy pillows make sleeping a delightful experience in this charming bedroom. The subtly patterned wallpaper and glittering chandelier make for a glamorous atmosphere, while the white vintage dressing unit fills the room with old world magic. Small mirrors in different shapes, sizes and materials circle the upper half of the dressing mirror, for an exclusive aura. While the large mirror makes the bathroom appear spacious and airy, the pretty pendant light charms with its enticing glow. 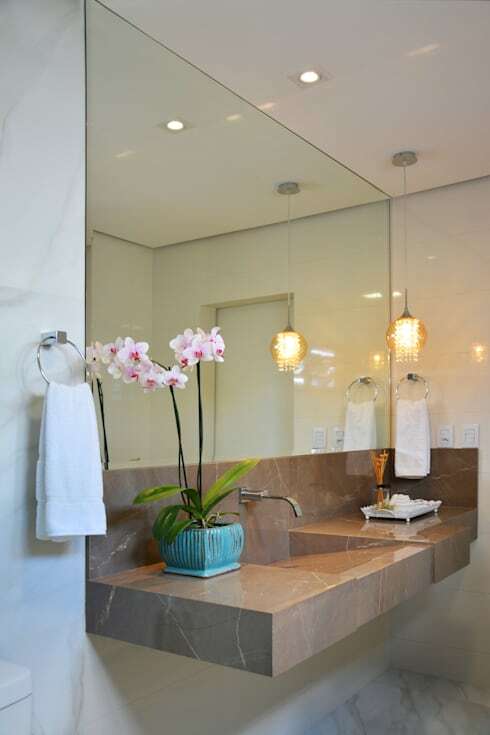 The earthy-hued porcelain counter accommodates a stylish basin and ample space for arranging toiletries. A chic turquoise pot holding a blooming plant lends natural freshness to the simple but elegant bathroom. Once you cross the grass-lined pathway under the shade of sleek wooden beams, you will reach the pretty porch of this residence. 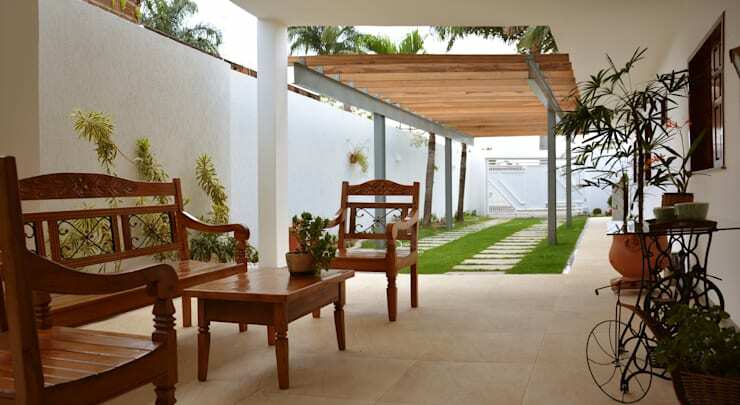 An antique bench, chairs and a coffee table offer sophisticated seating here, while lush plants rustle in the background when the wind blows. 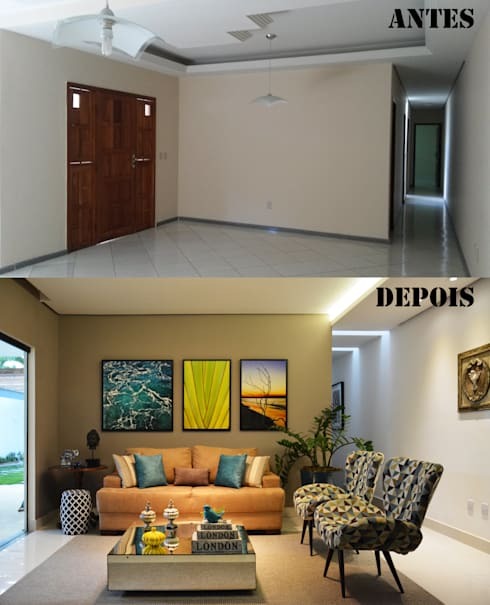 Inspired by how this bare and uninspiring Brazilian home reached the height of designer delight with some colourful and beautiful accents? Here’s another makeover story for more ideas - A Small Dull Apartment Reinvents Itself.